The City and Borough of Yakutat (/ˈjækətɑːt/, YACK-uh-tat) (Tlingit: Yaakwdáat) is a burgh in the U.S. state o Alaska. Incorporatit as a nan-unifee'd Home Rule Borough on September 22, 1992, Yakutat wis previously a ceety in the Skagway-Yakutat-Angoon Census Area (efterwairds renamit the Skagway-Hoonah-Angoon Census Area). The name is Tlingit, Yaakwdáat ("the place whaur canoes rest") but it oreeginally derives frae a Eyak name diyaʼqudaʼt an wis influencit bi the Tlingit wird yaakw ("canoe, boat"). ↑ 1.0 1.1 1.2 "The Home Rule Charter of the City and Borough of Yakutat" (PDF). Alaska Department of Commerce, Community and Economic Development. Retrieved May 4, 2012. ↑ 2.0 2.1 "Yakutat (populated place)". Geographic Names Information System. Unitit States Geological Survey. 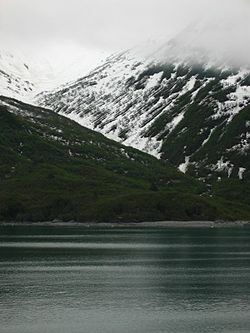 ↑ 4.0 4.1 "Yakutat". Division of Community and Regional Affairs, Alaska Department of Commerce, Community and Economic Development. Retrieved January 24, 2013. ↑ "Alaska Taxable 2011: Municipal Taxation - Rates and Policies" (PDF). Division of Community and Regional Affairs, Alaska Department of Commerce, Community and Economic Development. January 2012. ↑ "Population of Alaska by Labor Market Region, Borough and Census Area, 1990-1999". Alaska Department of Labor and Workforce Development. Retrieved January 20, 2009. This page wis last eeditit on 11 Mairch 2018, at 18:40.